Various Android and Linux images are available on Radxa Rock download page, but if you’d like to get newer images or other options, two developers have provided binaries and posted instructions to get Ubuntu 14.04 and Slitaz operating systems, the later currently booting with Linux kernel 3.10. Naoki FUKAUMI has published a miniroot how-to install a Ubuntu 14.04 Core (minimal headless installation) on Radxa Rock and Radxa Rock Lite. Installation should be relatively easy as he provide the update.img for both board so your can use the usual method in Windows (RkBatchTool) or upgrade_tool in Linux. If you don’t have serial console, you’ll have need to flash the parameter file requiring RkAndroidTool in Windows, and the same upgrade_tool in Linux. If once the installation and configuration is complete, you want a desktop environment,you can always run “apt-get install lubuntu-desktop” to install LXDE. SliTaz is a lightweight Linux distribution. I previously tried SliTaz with the Raspberry Pi, and I had a working headless image with a 18.6 MB rootfs and only 7 MB RAM used a boot time. Alanyih, one developer working on SliTaz for ARM platform, has also tried it successfully on the Radxa Rock, and shared the images and quick instructions with me. Simply login with root username, and root password to access the command line. It might also be possible to use a more up-to-date rootfs from http://arm.slitaz.org/rpi/, but it is only armel. Both Ubuntu 14.04 and Slitaz should be able to run on any Rockchip RK3188 device thanks to the device tree and multi-platform enabled Linux kernel, as long as you can somehow come up with the right device file for your device, which may not always be an easy task. kernel images used in my miniroot images are (currently) Linux 3.0 kernel based on Kitkat SDK. of course any other kernel for Radxa Rock can be used with my miniroot and/or any other userland(distribution such as Ubuntu), any other userland(distribution) for Radxa Rock can be used with Linux 3.0 kernel. kernel and userland(distribution) are different thing. OK. I saw some build instructions for 3.10, so I wrongly assume Ubuntu 14.04 would also boot using that one. I’ll update the post. to make my comment clear, I didn’t say 3.10 kernel will not work. I don’t know about it for now, but it’s just a matter of time. the reason I don’t mention about detail of kernel in ubuntu 14.04 page is because (basically) there is no relation/restriction between kernel and userland. the kernel and some programs in the rootfs might be dependent because sime programs depend on kernel headers, like iptables, tshark and some others. But most other programs will work. and, my miniroot doesn’t do any special thing at all, it’s just a shell and few common commands to start another root file system. without my miniroot, any Linux distro should be able to run on any Rockchip dongles/boxes/etc. in general, there is no rule like “only handle picuntu”. 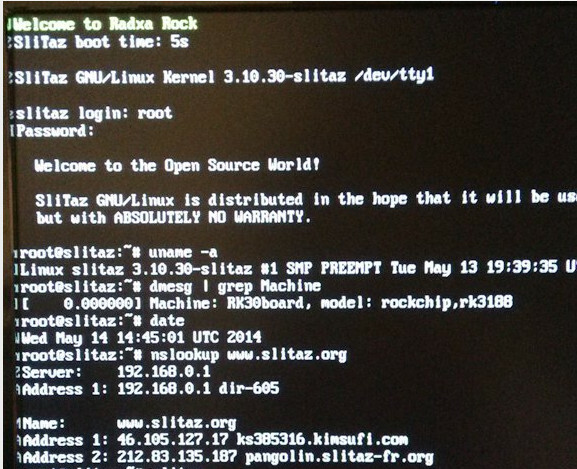 btw, Radxa Rock is good platform for hacking (include trying to install Linux). The slitaz-ramdisk.gz file is not available in the GIT source. Where can i download this file (because the initrd proces from http://www.cnx-software.com/2014/01/27/getting-started-with-raxda-rock-how-to-generate-and-flash-ubuntu-saucy-server-and-desktop-images/ is not compatible with this new kernel.